We often hear from people whose stories feature on the site, that old friends or family members have been in touch saying how proud they are of them for being so open and honest sharing such a personal experience with strangers. 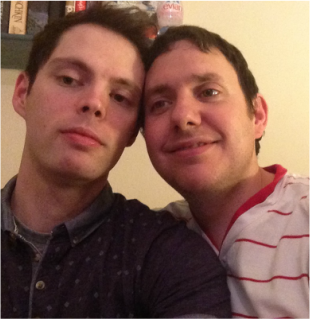 We first published Adam's coming out story in December 2012 and although the majority of what came next was positive, Adam felt that he wanted to write an update about his coming out experience. You can read Adam's original story here. I first posted my story a while ago, but recent events have made me need to add to it. Up until just recently my coming out had been as smooth as the majority of the others on RUComingOut. However, something happened that has changed that. It all started last summer when I finally worked up the courage to tell one of my oldest friends who is also the godfather to my son. At the time it seemed to go well, pretty much like any other time I told someone. After I told him we spent about another hour or so talking normally. We said goodbye and I thought all was well. He lives in Essex so we don't get to talk all that often but his lack of contact made me think that But even with that something was wrong. I texted him, Facebooked him but all to no avail. I put it down to him being busy. Now, as you have all probably read in these stories, we all say that if someone can't accept who we are then they are not worth our friendship. I was one of these people, until that moment. The complete shock of this reaction from a person I had known for thirteen years! I felt absolutely numb! We had been through a lot together, done a lot for each other and he was someone who I trusted to be my son's godfather. I had received the message while at work and for the first time ever in any job I had to find a quiet place to cry. As a rule I don't tend to show this sort of emotion. This hurt, a lot! I somehow managed to get through the rest of my shift by talking to some of my friends there. Once I got home I phoned my partner Dave, he was amazing, despite the fact I had made him wait up when he needed sleep. He let me know that he was there for me despite the fact that this would be hard for him too. I knew without him saying that he was worried that this would start making me question the choices I have made in the last few years. He had nothing to worry about, I love him deeply! After this I did another thing I haven't done for a very long time; I went and cried on my mum's shoulder. Yet again, she was just what I needed saying the right things. Cuddled me until I could stop. As you can tell I was struggling to go through with the whole, 'oh well he's not worth knowing' part. It has been nearly three months since this revelation and I struggle with it still. Writing this is helping and actually whilst writing this I have made a decision. I was right; if he can't accept me for who I am, he doesn't deserve me as a friend. I am no different from the person I have been for thirteen years! The only difference is I'm being me, the whole truth out there for the world to see! "I have never been happier in my life as I am right now and if he thinks he can come in and ruin that he's wrong. I have done nothing wrong, I have not changed." I am still the person that has done everything I have done for him in the past. I can now move on, feeling free in a way that he almost took away from me. My next action was the last contact with him unless something very drastic happens. I sent him the link to my coming out story, told him I'm un-friending him on Facebook and said that if he ever realises I'm still the same person as I ever was then he knows where I am. I know I am a good person and I don't 'need' his acceptance to know that. If you are reading this and you can relate to what has happened to me, just remember - don't let other people judge you and make you live in any way other than the way you want! It doesn't matter how long you have know someone, how much you value and care for them, if they can't accept you for who you are then they can just go away and leave you to get along with your life! Remember you are amazing and it's your life to live exactly how you want. And there will be plenty of people out there to love and care for you the way you deserve!